Mystery Babylon is also deeply symbolic… it’s a “mystery” because the prophets, at that time had visions but didn’t know of the existence of the North American Continent. They literally had no idea what they were actually seeing and described it as best they could. In ancient times, Babylon was the greatest city in the world just like the US is the greatest country in the world today. Ancient Babylon was constructed by people that came from all parts of the ancient world. What we may call today immigrants… just like the United States. It is very interesting that the great symbol that is situated in the harbor of New York City, the Statue of Liberty, is a woman carrying a torch. New York is the financial hub and capital of the world. It is the center of American and multi-national finance, marketing, and the location of the headquarters of the United Nations. 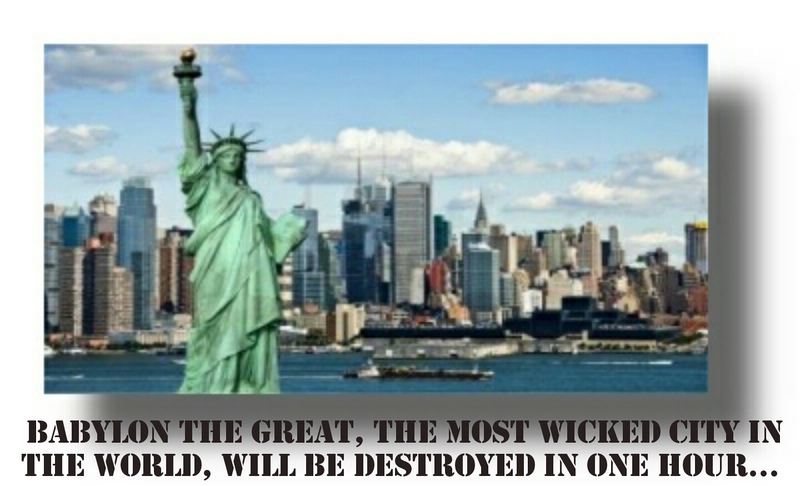 The Bible refers to a dominant city in the last days that is a major center of commerce that will be destroyed in one hour. Mystery Babylon The Great Whore. The churches will tell you it is referring to the Vatican in Rome. They are wrong. To hold the view that this Babylon is referring to the Vatican, you basically ignore 98% of the Scriptures referring to it and hold to one verse that can be easily discredited because a misunderstanding of one term in one verse that can easily be clarified. That is how warped the whole Vatican theory is that most churches and prophecy ‘gurus’ preach today when it comes to Revelation chapters 17 and 18. Why? Why do they want the focus on somewhere else instead of where the Bible is really speaking of? What Are Your Odds of Surviving the UWEX 16 Concentration Camps? This mystery Babylon the great is not a mystery to Gods people…Babylon the great changed her identity when she moved from the middle east, to Europe, and from Europe she moved to North America…It went from Babylon the great to Britain the great to America the great…God calls her mystery Babylon, because she moved from the middle east and changed her identity…The Babylonians believed in be all you can be…They set up a system of colleges through out their realm…The Babylonians like to study the planets and they believed in evolution…The nations idols are in the flags and the flags are high and lifted up on a flag pole and those who are serving the flags are called idol worshipers and God calls this type of flag service idolatry…There is no way to go around God and the carved images of the flag, because God said in Ex.20, and in De.4, “do not make or serve any carved image”…The founding fathers of the nations made carved images of the stars, the moon, the sun, of birds and four footed beasts, in the likeness of heaven above and in the likeness of the earth below and set the carved images in the flags to serve them…The devil uses Romans 13 to deceived those who are serving the flags…But they forget that He who said in Rom.13, “submit to the authorities”, also said in Ex.20 and De.4, “do not make or serve any carved image…The U.S. is reigning over the kings of the earth. Babel is the name used in the Hebrew Bible for the city of Babylon. It means “gate of the god”, corresponding to the Akkadian Bab-ili. According to Genesis 11:1-9, mankind, after the deluge, traveled from the mountain of the East, where the ark had rested, and settled in ‘a plain in the land of Shinar’ (or Sennar). Here, they attempted to build a city and a tower whose top might reach unto Heaven – the Tower of Babel – but God miraculously confounded the languages of those who were working at its building so that they could not understand each other, and the project failed. The classic story from the Old Testament of the Bible, the people of the Earth were building a colossal staged temple-tower or multi-storied ziggurat that would reach heaven and used it as a place of worship. The Tower of Babel, according to the Book of Genesis, was an enormous tower built in the plain of Shinar. The phrase “The Tower of Babel” does not actually appear in the Bible; it is always, “the city and its tower”. According to the biblical account, a united humanity of the generations following the Great Flood, speaking a single language and migrating from the east, came to the land of Shinar, where they resolved to build a city with a tower “with its top in the heavens … lest we be scattered abroad upon the face of the Earth.” God came down to see what they did and said: “They are one people and have one language, and nothing will be withholden from them which they purpose to do.” So God said, “Come, let us go down and confound their speech.” And so God scattered them upon the face of the Earth, and confused their languages, and they left off building the city, which was called Babel “because God there confounded the language of all the Earth.”(Genesis 11:5-8). The mark of the beast in the right hand or on the forehead is spiritual and identical to the pledge of allegiance to the flag…The mark of the beast in the right hand means the heart and the mark of the beast on the forehead means the mind…For with the heart we believe and with the mind we serve…Those who are being deceived by the signs of the false prophet are worshiping the beast as God almighty, because they believe in their heart that the beast is God almighty…It is by the signs of the false prophet that he causes them to receive the mark(name) of the beast in their right hand(heart) or on their forehead(mind)…Those who are worshiping the beast as God almighty it is because they already believed in their heart…The beast will be a Hitler type of a man. People invite the beast into their hearts by hate and ignorance thus the mark of the beast is in our hands (our works) and in our foreheads (thinking). We, as a nation, a religion, or family, denounce God by putting other things, thoughts, and our actions before God. The mark of the beast in the original greek, mark is the greek word “Charagma” which is the roman imprint that was imprinted onto money, state documents, and on slaves. Hence, no one can buy and sell without the mark. I learned this after having a dream where angels were showing me a US coin that had wings on each side, and there was a profile on it as usual and “in God we trust” written at the top arc and 6666 written on the lower arc. So, I started looking up 666 to try to find out what it meant. In the days of the prophet Daniel, the king of Babylon, at the sound of music, like the national anthem, the Babylonians, would bowed down to the golden image…Today, the daughters of Babylonian the great, at the sound of music, for the national anthem, the U.S. sings a song to the stars of heaven(Spangler Star)…First, they make an oration to the Spangler Star of heaven, by standing up with their right hand held to their heart, then they sing the song of the national anthem, to the Spangler Star of heaven…The U.S. is serving the stars of heaven and the eagle of the earth…Mexico is serving the eagle and serpent of the earth…Canada is serving the leaf of the tree of the earth…Japan is serving the sun of heaven…And Israel is serving the star of heaven to this day Acts Chapter 7…The nations idols are high and lifted up to heaven on a flag pole and the church leaders of God, cannot see the idols high and lifted up…The nations idols are even worn on their military and law enforcement uniforms…God said, “do not tattoo your body”…If you are wearing a uniform with a bird or a star on it, and you make a pledge of allegiance to the bird or to the star, by putting your right hand to your heart or by putting your right hand to your forehead, you are idol worshiping the bird and the star…The devil deceived the founding fathers of the all the nations, starting with Adam and eve, and they made carved images in the likeness of heaven above and in the likeness of the earth below. Adam and Eve were tricked by satan, I agree; however, they repented, and God forgave them. When they died their souls were NOT captured by the deceiver but only by GOD. As for me and my country, I always thanked God for our freedoms and liberty that He blessed us with at one time. Now the leader’s of our once great country have destroyed the very fabric of our Foundation but they may have destroyed it but they WILL NEVER destroy our souls for our (true believers)souls belong to GOD. AND JESUS THE SON OF GOD, THE KING OF KINGS AND THE ONLY TRUE LIVING GOD IS COMING SOON!! The end IS coming for Satan and his followers. The beginning is coming for the rest but NOT before the bloodiest battle EVER known to man! Unto God when sinners assailed. I said, He will hearken to me for I am full of righteousness. Because I was well off and had become rich in children. And their glory unto the end of the earth. They said they would never fan. And even I had no knowledge of them. Wow, I’m learning so much from y’alls comments. So interesting!